Convenient refill with necessary first aid kit components. 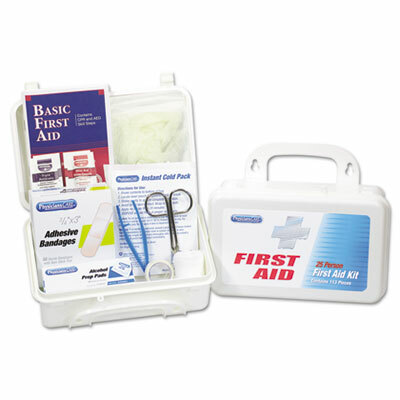 Designed to refill the First Aid Only� 10 Person Bulk ANSI Class A First Aid Kits (sold separately). Sufficient to treat ten people. 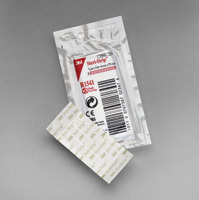 Contains: 5 x 9" Trauma Pad; Number of Pieces: 1; For Use With: Unitized First Aid Kits and Cabinets; Length: 4.125". Convenient refill with necessary First Aid Kit components. 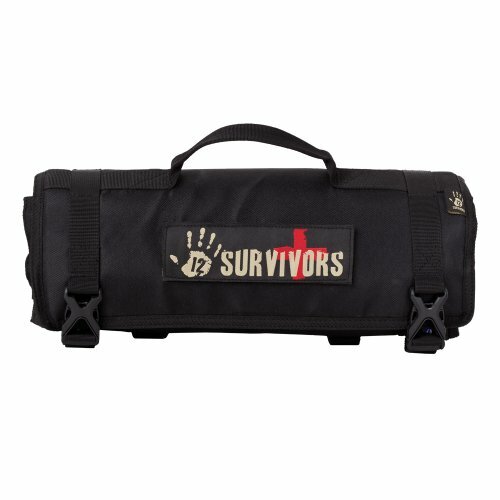 Designed to refill the First Aid Only� 10 Person Bulk ANSI Class A First Aid Kits (sold separately). Sufficient to treat 10 people. Contains: (16) Plastic Bandages, 1" x 3"; (1) First Aid Tape, 1/2" x 5yd; (10) Triple Antibiotic Ointment Packets; (10) BZK Antiseptic Towelettes; (1) CPR Mask with One Way Valve; (1) Burn Dressing, 4" x 4"; (10) First Aid/Burn Cream Packets, 0.9g; (1) Cold Compress, 4" x 5"; (2) Sterile Eye Pads; (1) Eyewash, 1oz; (6) Hand Sanitizer Packets, 0.9g; (4) Nitrile Exam Gloves; (1) Conforming Gauze Roll, 2"; (1) Scissors; (2) Gauze Dressing Pads, 3" x 3"; (2) Trauma Pads, 5" x 9"; (1) Triangular Sling/Bandage, 40" x 40" x 56"; (1) First Aid Guide; Number of Pieces: 71; For Use With: First Aid Only� 10 Person Bulk ANSI A Plastic First Aid Kit; First Aid Only� 10 Person Bulk ANSI A Metal First Aid Kit; Quantity: 1 each. Convenient refill with necessary first aid kit components. 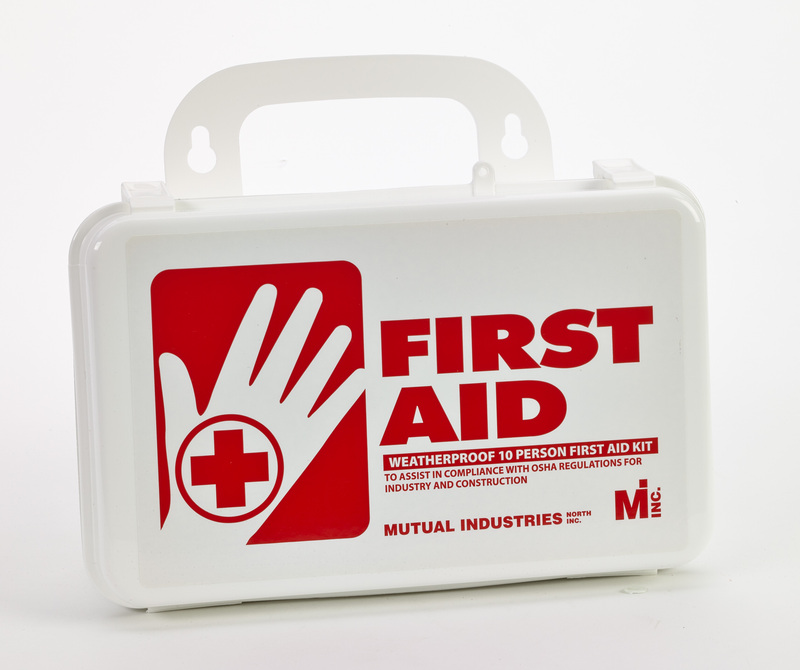 Designed to refill the First Aid Only� 10 Person Bulk ANSI Class A First Aid Kits (sold separately). Sufficient to treat ten people. 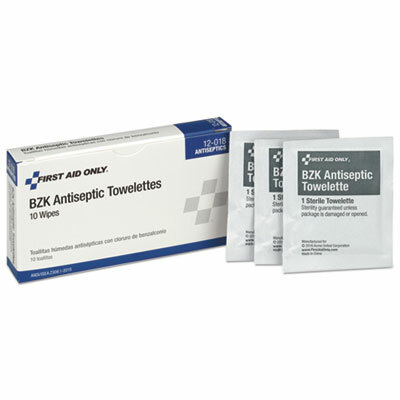 Contains: (10) BZK Antiseptic Wipes; Number of Pieces: 1; For Use With: Unitized First Aid Kits and Cabinets; Length: 4". Honeywell Eye saline 16 oz. 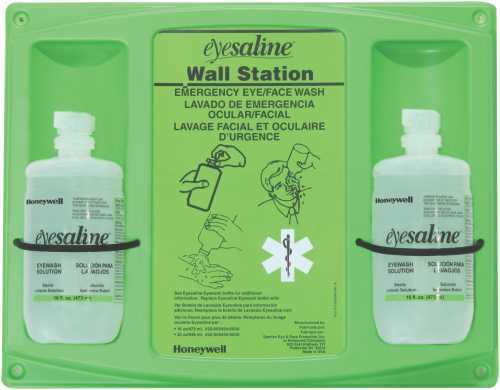 Double Eyewash Wall Station features Sealed, sterile, bottles containing a buffered, saline solution superior to tap water for emergency eye care. Blow-fill-seal bottles are tamper resistant, yet easily removed in an emergency, while extended flow opening provides longer flow rate than conventional bottles. Durable, open face design holds bottles firmly in place with easy access to bottles in an emergency. Ensured quality and lasting value with FDA-grade polyethylene bottles featuring lot numbers and expiration dates. DOES NOT MEET the current ANSI Z358.1 15-minute flushing requirement. Made in the USA. Trilingual. 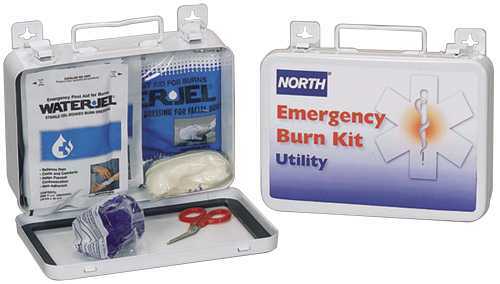 North 16 Unit Metal Utility Burn Kit provides the essential items to quickly treat burn emergencies. 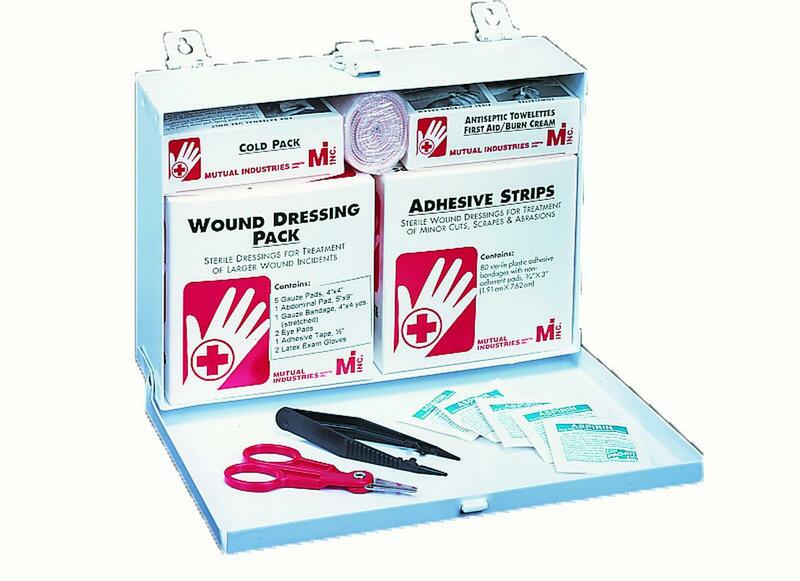 Includes: 2 pair medical gloves, scissors, 2 each 4" x 4" Water-Jel� dressings, 1 ea. 4" x 16" Water-Jel� dressing and 12" x 16" Water-Jel� face mask. Convenient refill contains all the necessities to replenish your first aid kit. Designed to refill 24 Unit ANSI A+ Weatherproof First Aid Kits. Sufficient to treat 50 people. Contains: 1 x 3 Adhesive Fabric Bandages; Number of Pieces: 1; For Use With: Unitized First Aid Kits and Cabinets; Length: 4". 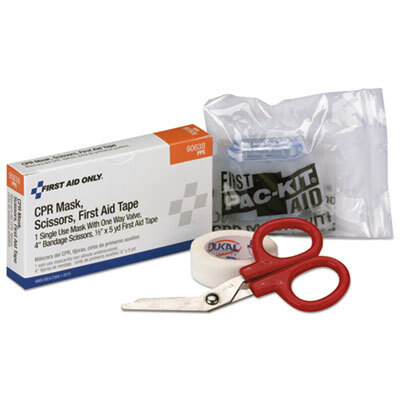 Convenient refill contains all the necessities to replenish your first aid kit. Designed to refill 24 Unit ANSI A+ Weatherproof First Aid Kits. Sufficient to treat 50 people. Contains: (1) 1-008: Fabric Bandages, 1" x 3", 16 ct; (1) 90638: 1 First Aid Tape, 1 CPR Mask, 1 Scissors; (1) 12-001: Triple Antibiotic Ointment Packets, 12 ct; (1) 12-018: BZK Antiseptic Towelettes, 10 ct; (1) 16-004: Burn Dressing, 4" x 4"; (1) 13-006: First Aid/Burn Cream Packets, 0.9g, 12 ct; (1) 21-004: Cold Compress, 4" x 5"; (1) 7-009: 1 Eyewash, 1oz, with 2 Eye Pads and 2 Strips; (1) 750013: Hand Sanitizer Packets, 0.9g, 10 ct; (1) 21-026: Nitrile Exam Gloves, 4 ct; (1) B204: Conforming Gauze Roll, 2", 2 ct; (1) 3-001: Gauze Dressing Pads, 3" x 3", 4 ct; (2) AN205: Trauma Pads, 5" x 9", 1/box; (1) 4-006: Triangular Sling/Bandage, 40" x 40" x 56"; (1) 350001: First Aid Guide; (1) 1-014: Knuckle & Fingertip Fabric Adhesive Bandages, 9 ct; (1) 1-007: 2" x 4" Patch Fabric Adhesive Bandages, 6 ct; (1) 12-015: Povidone Iodine Antiseptic Wipes, 10 ct; (1) 18-012: Hydrocortizone Anti-Itch Cream Packets, 12 ct; (1) 19-002: Sting Relief Wipes, 10 ct; Number of Pieces: 24; For Use With: First Aid Only� 24 Unit ANSI A+ Weatherproof First Aid Kits; Quantity: 1 each. Convenient refill contains all the necessities to replenish your first aid kit. Designed to refill 24 Unit ANSI A+ Weatherproof First Aid Kits. Sufficient to treat 50 people. 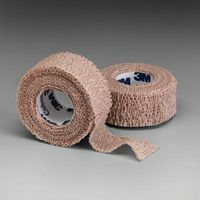 Contains: 4" x 4 yd Sterile Gauze Bandage; Number of Pieces: 1; For Use With: Unitized First Aid Kits and Cabinets; Length: 4.25". Convenient refill contains all the necessities to replenish your first aid kit. Designed to refill 24 Unit ANSI A+ Weatherproof First Aid Kits. Sufficient to treat 50 people. 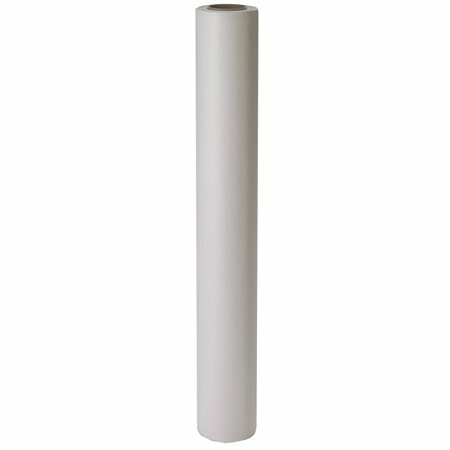 Contains: 40" x 40" x 56" Muslin Triangular Bandage; Number of Pieces: 1; For Use With: Unitized First Aid Kits; Length: 4". Convenient refill contains all the necessities to replenish your first aid kit. Designed to refill 24 Unit ANSI A+ Weatherproof First Aid Kits. Sufficient to treat 50 people. 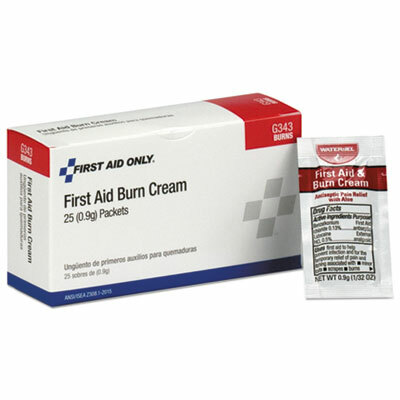 Contains: Burn Cream; Number of Pieces: 1; For Use With: Unitized First Aid Kits and Cabinets; Length: 4.25". 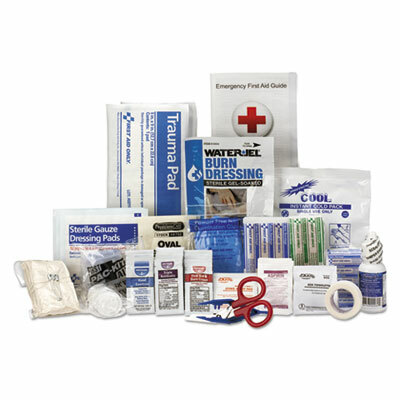 Convenient refill contains all the necessities to replenish your first aid kit. Designed to refill 24 Unit ANSI A+ Weatherproof First Aid Kits. Sufficient to treat 50 people. Contains: CPR Breather; Scissors; Tape; Number of Pieces: 3; For Use With: Unitized First Aid Kits; Length: 1.5". Convenient refill contains all the necessities to replenish your first aid kit. Designed to refill 24 Unit ANSI A+ Weatherproof First Aid Kits. Sufficient to treat 50 people. 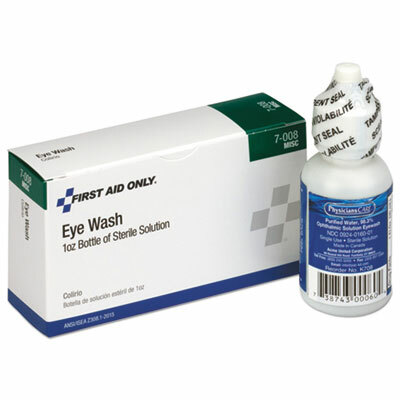 Contains: Eyewash 1 oz; Number of Pieces: 1; For Use With: Unitized First Aid Kits; Length: 4". 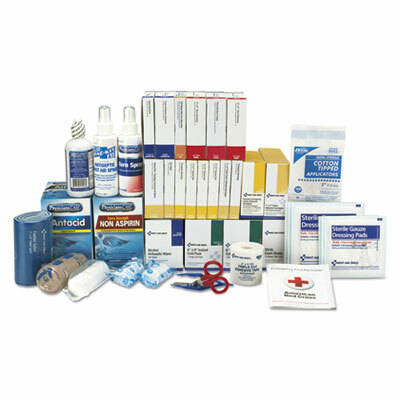 Convenient first aid kit refill is designed to deal with most common types of workplace injuries. Sufficient to treat 25 people or more. 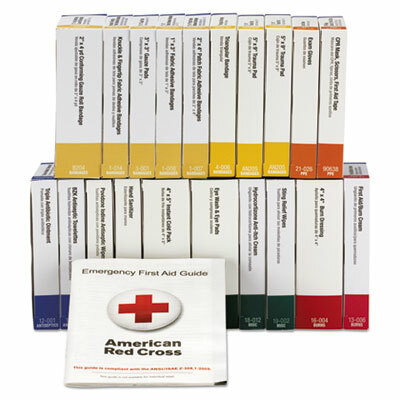 Complete refill for 25 Person Bulk ANSI A+ First Aid Kits (sold separately). 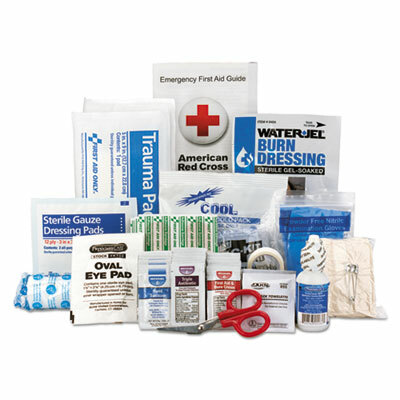 Contains: (50) Plastic Bandages, 1" x 3"; (1) First Aid Tape, �" x 5 yd; (10) Triple Antibiotic Ointment Packets; (12) BZK Antiseptic Towelettes; (1) CPR Mask with One Way Valve; (1) Burn Dressing, 4" x 4"; (10) First Aid/Burn Cream Packets, 0.9g; (1) Cold Compress, 4" x 5"; (2) Sterile Eye Pads; (1) Eyewash, 1oz; (10) Hand Sanitizer Packets, 0.9g; (4) Nitrile Exam Gloves; (1) Conforming Gauze Roll, 2"; (1) Scissors; (6) Gauze Dressing Pads, 3" x 3"; (2) Trauma Pads, 5" x 9"; (1) Triangular Sling/Bandage, 40" x 40" x 56"; (1) First Aid Guide; (5) Fingertip Fabric Bandages; (5) Knuckle Fabric Bandages; (3) Insect Sting Relief Wipes; (1) Tweezers; (12) Aspirin Tablets; Number of Pieces: 141; Quantity: 1 each. 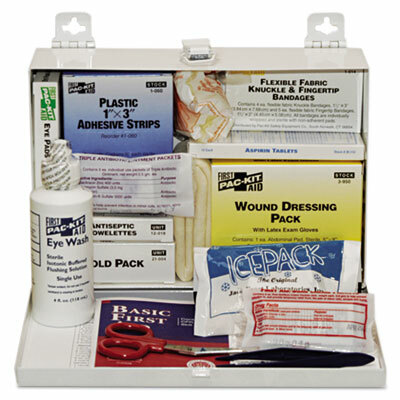 Equip your home, office and automobile with this 113-piece kit that includes alcohol pads, antibiotic ointment, bandages, first aid cream, instant cold pack, scissors, tape, tweezers, gloves and a first aid guide. Comes in plastic case. System Capacity: Up to 25 Person System; Number of Pieces: 113; Contains: Antiseptic Wipes; Bandages; Burn Cream; First Aid Cream; Forceps; Instant Cold Pack; Scissors; Sterile Pad; Mounting: Wall. Neat, orderly interior packaging. Makes content easy to locate and use. 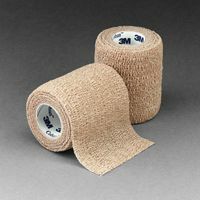 System Capacity: 25; Number of Pieces: 143; Contains: Plastic Adhesive Strips; Fabric Knuckle Bandage; Fabric Fingertip Bandages; Sterile Gauze Pads; Large Wound Pad; Triangular Bandage; 1/2" x 5 yd. Adhesive Tape; Nitrile Exam Gloves; Antiseptic Wipes; First Aid/Burn Cream Packets; Triple Antibiotic Ointment Packets; Eye Flush; Eye Pads with Strips; Pain Relief Tablets; Instant Cold Pack; Scissors; Forceps; First Aid Guide (ANSI 2009 version); Case Material: Steel. Convenient refill contains all the necessities to replenish your first aid kit. 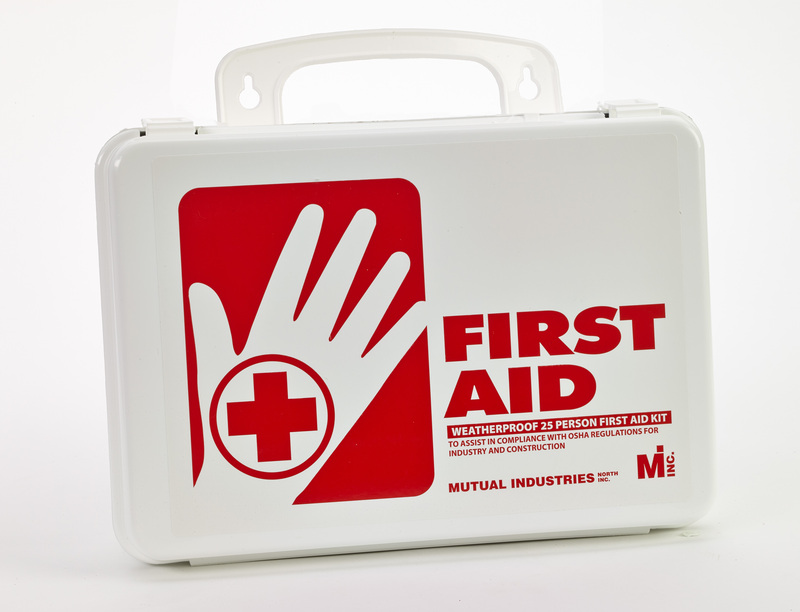 Designed to refill the First Aid Only� ANSI 3 Shelf First Aid Station with Medications (sold separately). Sufficient to treat 100 to 150 people. 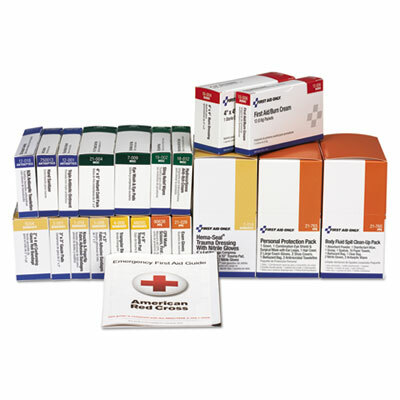 ANSI Class B+ compliant when used with the First Aid Only� ANSI 3 Shelf First Aid Station with Medications. Contains: (1) G122: Fabric Bandages, 1" x 3", 100 ct; (1) M660: Tri-cut Waterproof Tape w/ Plastic Spool; (1) G460: Triple Antibiotic Ointment Packets, 25 ct; (1) 13-080: Antiseptic Spray, 4oz; (1) 21-011: CPR Mask with One Way Valve; (2) 16-004: Burn Dressing, 4" x 4"; (1) 13-040: Burn Spray, 4 oz; (2) M564-E: Cold Compress, 6" x 9"; (1) 7-002: 4 Sterile Eye Pads and 4 Strips; (1) 7-006: Eyewash, 4oz; (1) 750013: Hand Sanitizer Packets, 0.9g, 10 ct; (1) 21-226: Nitrile Exam Gloves, 10 ct; (2) M246-1000: Conforming Gauze Roll, 2"; (1) 17-008: Scissors; (3) AN205: Trauma Pads, 5" x 9", 1/box; (2) 4-006: Triangular Sling/Bandage, 40" x 40" x 56"; (1) K504: Stretch Gauze Bandage, 4"; (1) 350001: First Aid Guide; (1) M584-2000: Tweezers; (1) 1-007: Fabric Bandages, 2" x 4", 6 ct; (1) G140: Fabric Knuckle and Fingertip Bandages, 50 ct; (5) M215-DUKAL: Gauze Dressing Pads, 3" x 3", 2 ct; (5) M216-DUKAL: Gauze Dressing Pads, 4" x 4", 2 ct; (1) H305: Alcohol Wipes, 100 ct; (1) 90016: Non-Aspirin Tablets, 100 ct; (1) 25-400: Cotton Tipped Applicators, 3", 100 ct; (1) 5-903: Elastic Bandage, 4" x 5yd; (1) 336007: Padded Splint, 4" x 24"; (1) G343: First Aid/Burn Cream Pack, 0.9g, 25 ct; (1) 90089: Antacid Tablets, 100 ct; (1) 2-016: 1 Hema-Flex 5" x 9" Trauma Pad in 4" x 4" Gauze; 2 Nitrile Gloves; Number of Pieces: 675; For Use With: First Aid Only� ANSI 3 Shelf First Aid Station with Medications; Quantity: 1 each. Convenient refill with necessary First Aid Kit components. 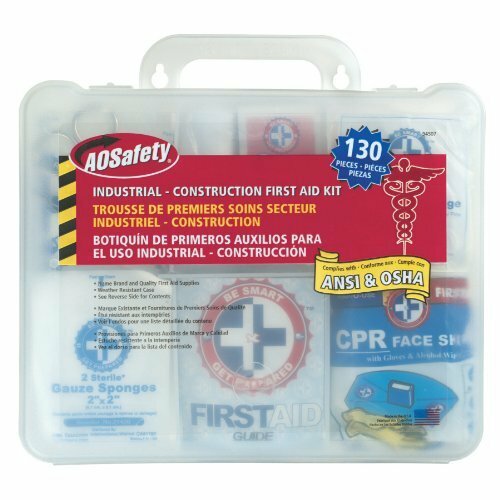 Designed to refill the First Aid Only� 36 Unit ANSI Class A+ Metal Weatherproof First Aid Kit with BBP Pack (sold separately). Unitized contents. Sufficient to treat 75 people. Contains: (1) 1-008: Fabric Bandages, 1" x 3", 16 ct; (1) 90638: 1 First Aid Tape, 1 CPR Mask, 1 Scissors; (1) 12-001: Triple Antibiotic Ointment Packets, 12 ct; (1) 12-018: BZK Antiseptic Towelettes, 10 ct; (1) 16-004: Burn Dressing, 4" x 4"; (1) 13-006: First Aid/Burn Cream Packets, 0.9g, 12 ct; (1) 21-004: Cold Compress, 4" x 5"; (1) 7-009: 1 Eyewash, 1oz, with 2 Eye Pads and 2 Strips; (1) 750013: Hand Sanitizer Packets, 0.9g, 10 ct; (1) 21-026: Nitrile Exam Gloves, 4 ct; (1) B204: Conforming Gauze Roll, 2", 2 ct; (1) 3-001: Gauze Dressing Pads, 3" x 3", 4 ct; (1) AN205: Trauma Pads, 5" x 9", 1/box; (1) 4-006: Triangular Sling/Bandage, 40" x 40" x 56"; (1) 350001: First Aid Guide; 1) 1-014: Knuckle & Fingertip Fabric Adhesive Bandages, 9 ct; (1) 18-012: Hydrocortizone Anti-Itch Cream Packets, 12 ct; (1) 19-002: Sting Relief Wipes, 10 ct; (1) 2-014: Hema-seal 4" Major wound compress; (1) 21-760: Body Fluid Spill Clean-Up Pack (20 pcs); (1) 21-765: BBP Personal Protection Pack (7 pcs); Number of Pieces: 36; Quantity: 1 each. 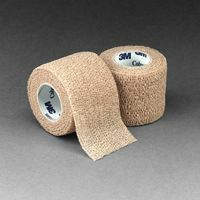 3M� Coban� self adhering wrap for constant compression. Ideal for use over hair or delicate skin. Beige. Select size: 1" x 5 yards, 2" x 5 yards, 3" x 5 yards, 4" x 5 yards, or 6" x 5 yards. Sticks to itself without need for adhesive, pins or clips for fast and easy application. Wrap will not slip so no need for frequent readjustment. Comfortable for patients Lightweight, porous Protects primary dressings Desired amount of compression at time of application Wrapping splints/arm boards Compression dressing Overwrap for Unna's boot Holding other dressings Securing I.V.s and other devices/sterile drape stabilization Wrapping leg post-operatively Caution: This Product Contains Natural Rubber Latex Which May Cause Allergic Reactions. This item cannot be shipped to APO/FPO addresses. Less scarring when compared to staples or sutures. 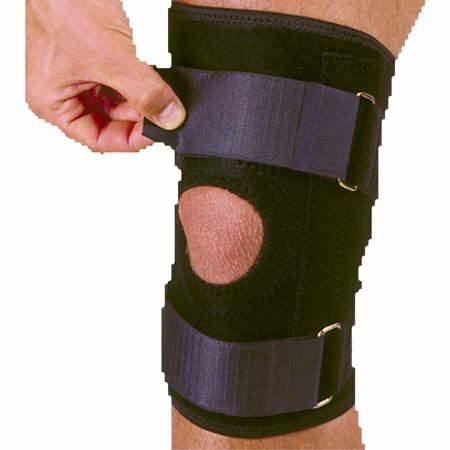 Enhances patient comfort and less chance of infection than with sutures or staples. Fast application. Comfortable to wear. Reduces likelihood of skin irritation. Providing wound support following early suture or staple removal. Appropriate for low tension wounds. Emergency Department. Operating Room. Clinics and physician's offices. Same day surgery centers. Hypoallergenic and sterile This item cannot be shipped to APO/FPO addresses. 3M� Cold/Hot Gel Pack- flexible, reusable pack works for hot or cold therapy. Place in the refrigerator or freezer for cold. Microwave for heat. 4"x10" size 2 pack. A convenient way to apply cold first aid Soft, gel-filled pillow that can be used on any part of the body An excellent solution for those who prefer drug-free therapy. 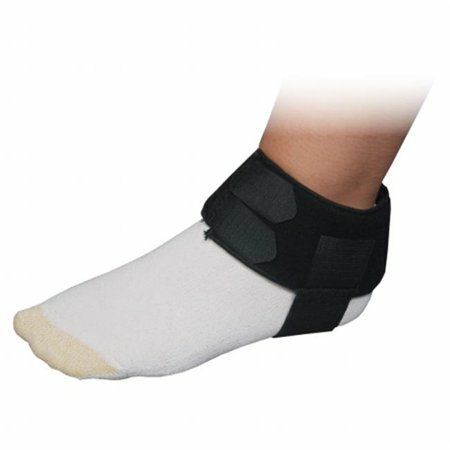 First aid treatment for minor injuries to reduce swelling and relieve pain. This item cannot be shipped to APO/FPO addresses.